Faux Wash n' Go on 4C Hair Tutorial | Natural Hair Rules!!! Following up from my last post 10 Things Women With 4C Hair Should Know, as promised I am going to give you the details about what I have come to call a Faux Wash n’ Go. When you hear the term wash n’ go, you think of getting in the shower, cleansing your hair, putting some type of gel product in your hair and going. For SOME of us 4C ladies a wash n’ go is not doable. 4c ladies avoid the wash n’ go at all costs for more reasons than just the aesthetics of the end result; we get breakage and matting when our hair type shrinks up to 75% not a cute and easy natural hairstyle. I don’t know how you feel about that, but for me it’s definitely not cool. What I have discovered is, that for me, I have better looking results working on damp or air dried hair and not soaking wet strands. Not only do I end up with shrunken hair when I start with soaked hair, my hair ends up being more dry, more tangly, and more matted. My damp to air dried hair absorbs products better, stretches more easily and styles nicely. My hair is worn in a two strand twisted hair style that has stretched my hair and given me some curl definition. I get in the shower, let enough water run through my hair to the point where it is damp but not totally saturated (no shampoo or conditioner is used at all just water). I use an ample amount of Shea Moisture Curling Souffle or alternatively Wonder Curl Get Set Jelly works just as well. Again women who are able to do an actual wash n go’s simply, wash their hair, put product on it, let it dry and go. I am clearly not doing that here. The set of twists that were in my hair are giving me the curl definition that you see and I am only rinsing my hair (which is why my shrinkage isn’t so drastic). My hair also isn’t getting very dry because my natural oils are not getting stripped since I am not stripping them with shampoo but only giving it a light rinse. The jelly products that I like to use help to keep stretch in my hair, moisturize it, and further enhance the curl. So I basically prep my hair before my faux “wash n’ go” and rinse my hair not wash it. My faux wash n’ go ends up giving me the look of a wash n’ go and I am sure my hair loves it since it is quite moisturizing. The picture of me with the ponytail and the big earrings is from when I used this technique a couple of months ago. 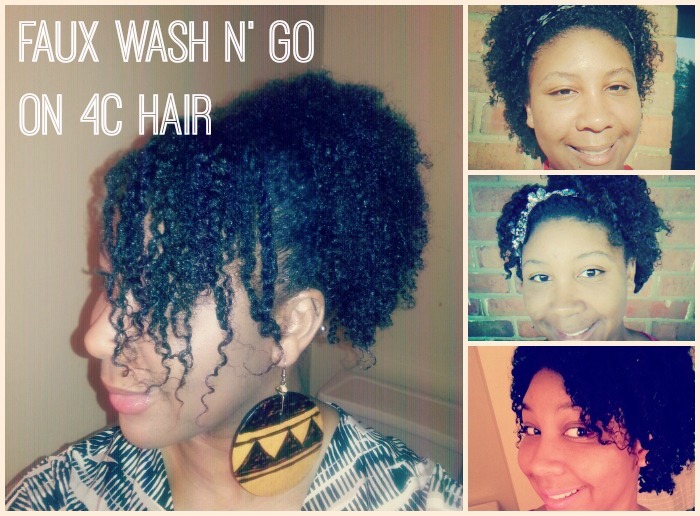 A faux wash n’ go is also a great trick when you are having a bad dry hair day. If you should find yourself with an old dried up twist out, do a quick rinse , add some jelly and you are set ! So if you have always loved the idea of a wash n’go but didn’t have the tresses to do it try my faux wash n’ go; you’ll love it! So do you moisturize your hair first, then lightly rinse it? And can hot also just use a spay bottle to prevent from getting in the shower when doing the faux wash?